Pan and moons like it have profound effects on Saturn's rings. The effects can range from clearing gaps, to creating new ringlets, to raising vertical waves that rise above and below the ring plane. All of these effects, produced by gravity, are seen in this image. 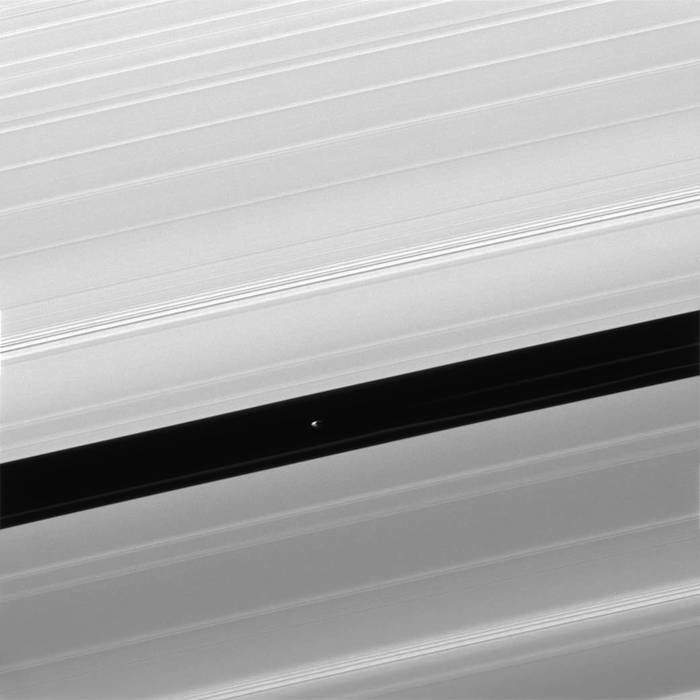 Pan (17 miles or 28 kilometers across), seen in image center, maintains the Encke Gap in which it orbits, but it also helps create and shape the narrow ringlets that appear in the Encke gap. Two faint ringlets are visible in this image, below and to the right of Pan. Many moons, Pan included, create waves at distant points in Saturn's rings where ring particles and the moons have orbital resonances. Many such waves are visible here as narrow groupings of brighter and darker bands. Studying these waves can provide information on local ring conditions. The view looks toward the unilluminated side of the rings from about 22 degrees below the ring plane. The image was taken in visible light with the Cassini spacecraft narrow-angle camera on April 3, 2016. The view was obtained at a distance of approximately 232,000 miles (373,000 kilometers) from Saturn and at a Sun-Saturn-spacecraft, or phase, angle of 140 degrees. Image scale is 1.2 miles (2 kilometers) per pixel.